On Monday April 7 at 6pm PDT I’ll be giving a Virtual Worlds Lecture in Second Life. One must always seek a thoughtful match between pedagogy and technology. Different virtual world platforms are suited for different uses, ranging from collaborative work environments to immersive goal-oriented simulations. The speaker will discuss current virtual world technological trends involving specific gaming technologies like Unity3D and the growth of Open Source platforms such as OpenSimulator. A discussion will focus on helping educators choose the right tool for the right job, matching pedagogical goals with technological affordances. My presentation is part of an ongoing series of talks hosted by the School of Library and Information Science at San Jose State University. Here’s more information about the colloquia, and here’s a SLURL for where I’ll be speaking. Part of what I’ll be doing in addition to showing slides and speaking will be a live demo of some of the content import/export tools in the Singularity Viewer. You’ll get so see how you can easily backup content you’ve created in Second Life or Opensim to your hard drive and how to get that content into other 3D platforms like Unity3d and Blender. 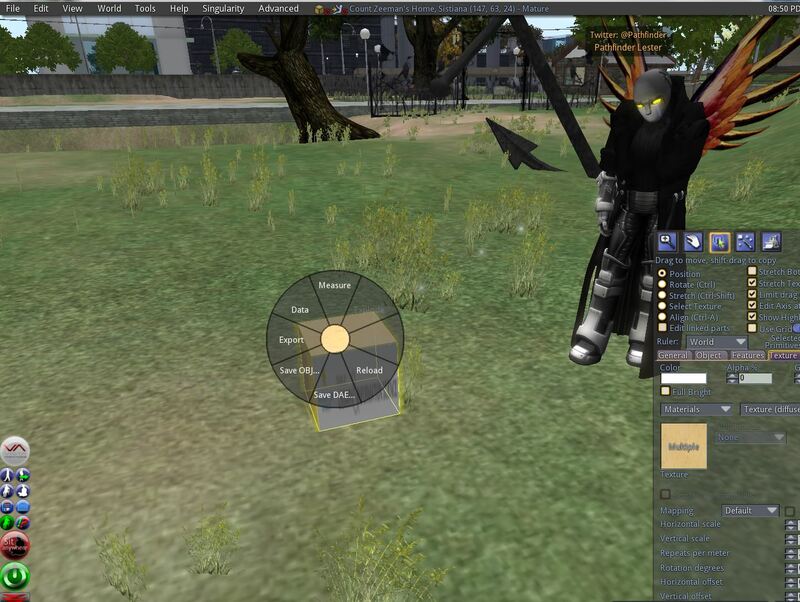 This entry was posted in Announcements, Education, OpenSim, Presentations, Unity3D, Virtual Worlds and tagged library, metaverse, OpenSim, San Jose State University, second life, Singularity, Unity, Unity3d, virtual worlds by John "Pathfinder" Lester. Bookmark the permalink. Hope I remember to go. Cool! Hope to see you there.